We "finished" up our spring unit with flower planting. I say "finished," because discussions of spring pop up now and then. 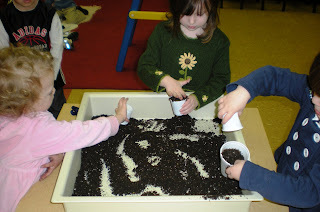 The children LOVE to plant flowers--playing with dirt and water, who wouldn't find that fun? They just can't wait for those little shoots to make their appearance. We'll be keeping an eye out. 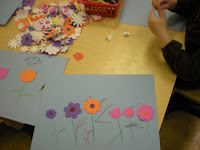 We began the day talking about what a flower needs to grow. We read a GREAT book that the children, and myself, find so funny. 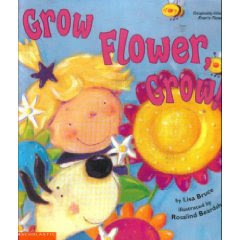 It's called "Grow Flower, Grow! ", by Lisa Bruce, illustrated by Rosalind Beardshaw. It was previously titled "Fran's Flower." It's about a little girl, Fran, that finds a little shoot in a flower pot and wants it to grow. Some of the things she does to get that flower to grow are pretty funny. I had a tub of dirt, plate of seeds, and a bucket of water on the table. 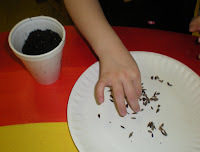 The children put dirt in their cup, counted three seeds to add in, then watered it. I then lay plastic wrap over all the cups and set them in the window. The plastic wrap gives the "greenhouse effect" to help the plants grow quicker. 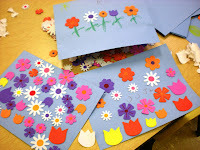 We keep the flowers at school to go home as part of our Mother's Day gifts. I then kept the rest of the dirt with some cups out for the children to play in. 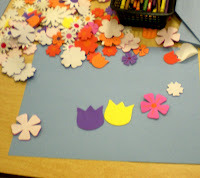 I was going to use one table to put out foam pieces and glue with paper and let the children create flowers with the foam. When I went to the foam tub I found a big bag of foam flower stickers. I thought this would be fun. They got some good motor skill practice trying to peel the backs off the stickers. 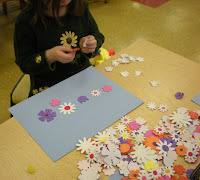 I was amazed at some of the add-ons, like petals, stems, and suns that some of them added. Now we wait--"Grow Flower, Grow!" 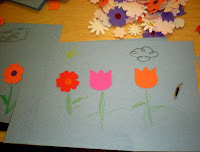 I think my daughter's preschool teacher got a Spring pack with seeds for the kids. She's excited about planting with the kiddos. 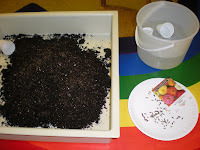 I love the big bin of dirt-great idea for the classroom! I'll have to share this post with her. 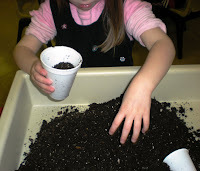 When I was student teaching in kindergarten, I made "dirt" in a big flower pot with gummy worms inside-fake flowers on top and served it to the kids. It was a hit. Have a great day! I'm super busy throwing birthday parties! I have two more to go. Surprise party on Sat. for hubby and another b-day at the end of the month for my almost 7 year old. Okay, done writing my book. Have a wonderful day!